Recently, someone suggested to me to possibly start doing double reviews for comics. I was reluctant at first, because I don’t want a review of mine to be competing with itself, and I am starting to work out a rhythm to these that I want to keep. I’m going to go ahead and say that neither of these comics are bad. They’re both pretty decent. Neither really wowed me though, and both really have similar strengths and weaknesses. They both also flowed in the same manner. Aquaman: Rebirth picks up with Arthur Curry fighting off an attack from the Deluge, a cell of xenophobic Atlantean terrorists bent on attacking the surface world. This and the remainder of the comic is being narrated by an unknown observer who seems to know Aquaman very well. Aquaman defeats the Deluge, while the story keeps cutting to Mera and the staff of Spindrift Station watching as well as news shows questioning the heroics and motives of Aquaman. The comic ends with Aquaman meeting Mera at a diner to discuss the day. It then reveals who the mysterious narrator is, the identity of which I won’t reveal here. Flash: Rebirth runs concurrently with the Rebirth comic itself, with Barry Allen (who, for the record, is my favorite DC super hero) investigating a murder. The circumstances of this murder hauntingly resemble the killing of his mother and the subsequent incarceration of his father. His coworker, Detective Singh, is concerned that Barry is too emotional to investigate, but Barry resolves to stay on the case. He begins to get visions of Kid Flash (the original Wally West), Professor Zoom (Eobard Thawne), and an unknown third speedster in a white and red suit. He seeks advice from his now-absolved father, who suggests that he rests up. He then proceeds to analyze the evidence, using his speed to simultaneously help around Central City while the equipment works. He then encounters Wally West in the scene from the Rebirth comic. The two have their emotional reunion, and then Barry goes to talk with Batman about what each them have learned from Wally. The comic ends with a silhouette at the crime scene resembling a certain villain, the identity of which I won’t spoil either. Neither pays much service to characterizing their hero for any new readers who are jumping on here. Flash: Rebirth does pay a bit of service to the old-fashioned heroism that is Barry Allen’s defining trait, but it doesn’t do too much more than that. Aquaman: Rebirth is a far worse offender on this front. Dan Abnett has been doing a good job of breathing life and personality into Arthur Curry over recent issues. Here, the mystery narrator’s description of Aquaman only draws attention to how much more interesting this character should be versus how he really is. I realized how similar Aquaman and Black Panther are in terms of their jobs and roles, and all I could think about was how much more intriguing T’Challa is than Arthur Curry. They’re both kings with people who have harbored mistrust for them, and they both do their best to broker peace between their nations and the outside world. However, Black Panther’s personality and actions reflects his role far better than Aquaman’s personality. I say this as a fan of both characters. 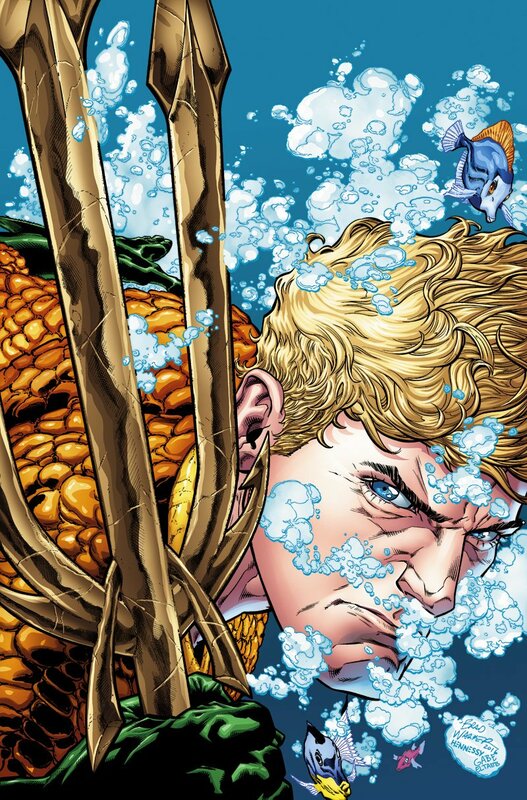 However, more effort could be expended to make Aquaman a unique and interesting character. Hopefully the very skilled Dan Abnett will resolve this in future issues. In terms of action and sparking interest, Aquaman has more going on. The Deluge threat is a pretty cool threat for Aquaman to deal with, and it is a fairly complex situation for Arthur to have to deal with. It also has some pretty cool fight scenes included with Aquaman fighting off some members of the terror cell. Flash doesn’t have a whole lot going on for itself. Other than foreshadowing villains, the bulk of the comic is spent retelling the latter portion of DC Universe: Rebirth. That was probably an order from up the chain of command that the creative team didn’t have a say in, but the comic still suffered for it. Both have a bad case of telling and not showing. Aquaman tries to tell you everything it feels you need to know about Arthur Curry instead of showing his personality through his actions. Flash decides to summarize the last section through narration as well, and it’s not particularly engrossing. In terms of art, both comics have their troubles. I found the art underwhelming throughout Flash: Rebirth. It was pretty cartoonish, and it wasn’t detailed enough to be stylistic. That being said, there is a really cool two-page spread of Wally West and Barry Allen running alongside one another. Aquaman: Rebirth had some cool art at the beginning and the end, but it continues to change styles in the middle, sometimes in between turns of the page. It’s very distracting when a comic changes art styles within the same field of view. In each, the surprise villain appearance at the end was by far the most exciting part. The rogues were well-chosen for the stories. Again, both comics worked as a whole, but neither really excited or intrigued me in a way that a first issue of a new era should. They set up for future stories, but they’re so wrapped up in that goal that they don’t do much for the present. If you’re a fan of either character, take a look, but keep your expectations in check.